Back in 2011 Emma Donoghue wrote a novel that captured the hearts of all those who read it. Room, which was conceived after she heard the story of five-year-old Felix in the Fritzl case. The story follows five-year-old Jack who lives in an outbuilding with his mum. That one room is the only world he has ever known and believes that the rest of the world only exists via TV. What he doesn’t know is that his mum was kidnapped at the age of 19 and he is the product of her being raped by Old Nick who comes to see his mum at night bring food and essentials whilst he hides in the wardrobe. 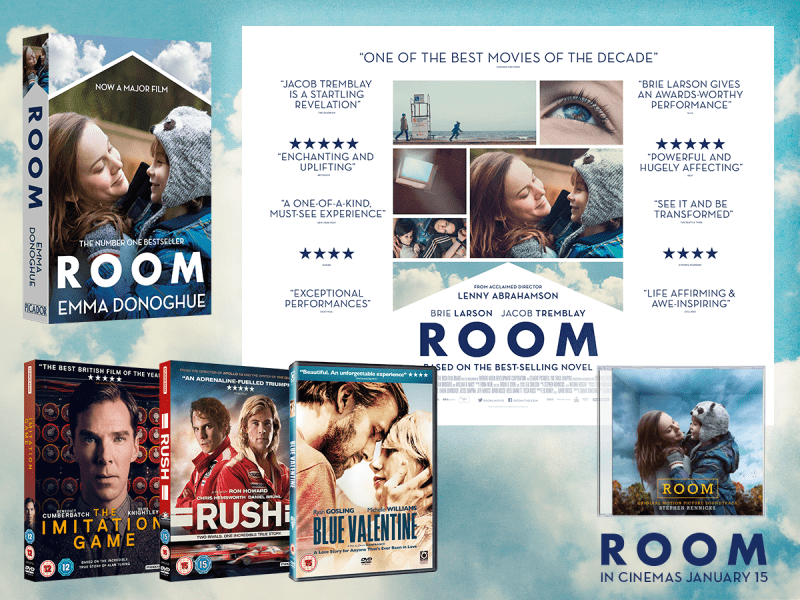 The best-selling and award-winning novel has been made into a feature-length film from Studiocanal and is released into cinemas tomorrow. 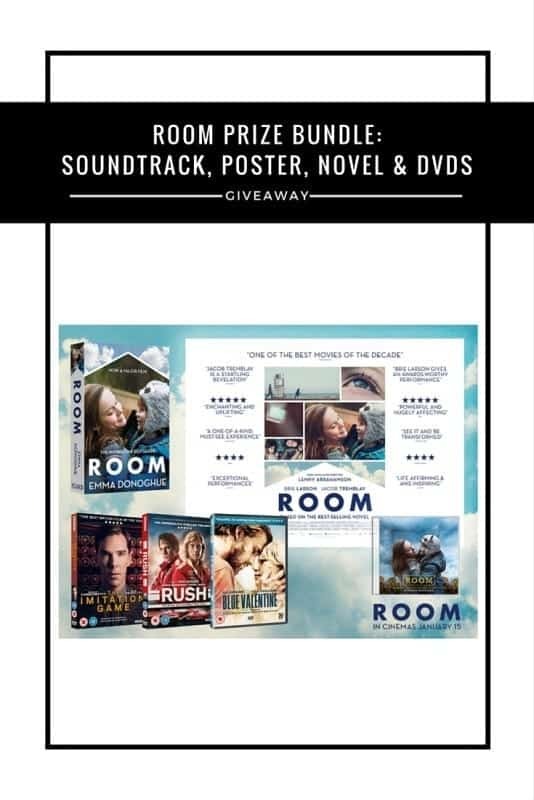 To celebrate the release of Room into cinemas from Friday 15th January, Boo Roo and Tigger Too are lucky enough to have a Room prize bundle to giveaway. I think it’d be trees! Not much after working nights for 20yrs and will go with the rain. I’d miss being in my garden. definatly would be my family! I’d really miss walking in the park and feeding the ducks! I would miss the open spaces! The day to day noise of life. I’d miss my local library most – I can’t read the same book twice so I’d be lost!! I’d miss my family and friends! Love them so much! Water – the sound of the river, watching the ducks on the pond or the seagulls at the coast. I would miss going out and seeing the sky. I think that I would miss the rain the most. Wifi……. And my family of course!!! God, everything! Id go insane. Id miss walking my dog Molly with my lovely family, no walks would mean no peace and thinking time! Apart from certain people, I would really miss a nice big bar of Galaxy! I would miss fresh air! I would miss lots, but I think in the end I would miss contact the most – I get cabin fever after about 6 hours! Apart from my family, probably fresh air! I’d miss my daily run through the woods behind our home (plus family & pets). I’d miss my family…and fresh air! I’d miss my daughter, especially her smile and singing voice, my dog and her funny little face, the warmth of the sun, fresh air, and listening to music. I could go on and on….hope I never get locked in a room! I’d miss all the friendly locals. The Outside smells liked cut grass. The warmth and light from sunshine or just weather in general. Walking out on a cold crisp morning or sitting in the garden in summer with a glass of wine. Aside from people. I’d miss walking. My family & driving in the sunshine! I’d miss the random daily interactions with people. I would miss the feeling of wind blowing through my hair! I would miss star gazing! Fresh air! I would miss it. I would miss the buzz of everyday life and the feel of the wind, rain and sun on my skin. I would miss my family and good food. The feeling of sand between my toes on a warm day. Walks with my labrador …. It would be interaction with other human beings, that flow of conversation and opinions on a ‘normal’ life. My family without them life would cease to exist .I cant wait to see this film. Walking my dogs in the countryside. People. I couldn’t survive without company. I’d miss weather. Wind, rain, snow, sun. I would miss going for walks with my family and my dogs and feeding the ducks along the canal. I would miss the daylight. The freedom to do whatever I want! I would miss love! A smile a kiss a hug from my two sons! I’d miss my son and my dogs. I’d miss the sunshine and the sights, sounds and smells of life! The sunshine – without it just like a plant I would wither up and die! The fresh air, being cold, being warm, seeing the seasons change, and seeing how everyone is. If my family wasn’t with me I’d miss them but if they were, I’d miss fresh air and walking in the countryside the most. Walking in the fresh air.